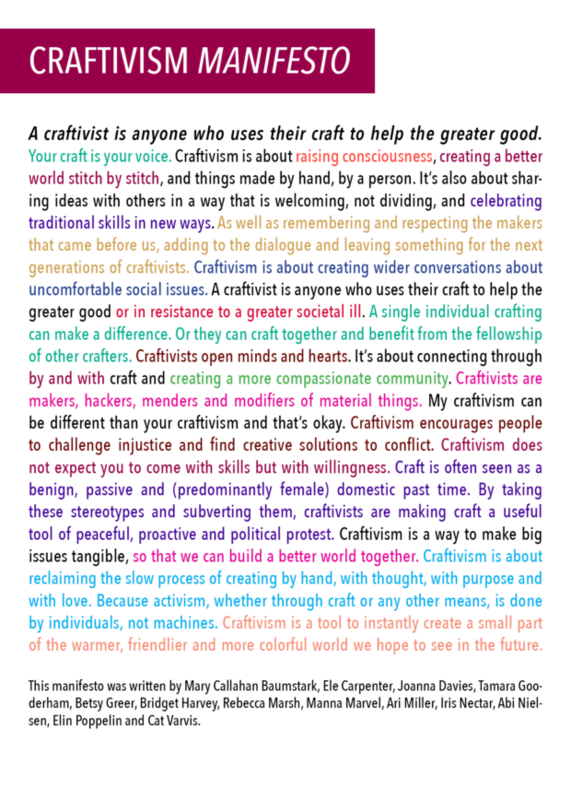 The craftivism manifesto - craftivism. Awhile ago I asked people to help me write a manifesto for craftivism. Twelve people shared their thoughts; this is what we created. These thoughts perfectly encapsulate how I envisioned craftivism from the beginning and I am thankful beyond words to have had input from such amazing and inspiring makers. This is not the end all be all definition of craftivism, nor is any other document. Craftivism is what you make of it, as it was born out of DIY punk roots on my end and activist craft has been made without rules for thousands of years before I came along. As the manifesto says, “Your craft is your voice. Use it well.” So, go, use your craft well. And make your own manifesto if you see fit! Click here for a PDF version. And click here for the Spanish version. Kindly and deftly designed by the unstoppable Leanne Prain. This manifesto is free to distribute and use as you wish. If you repost it online, adding a link back to the original document would be most appreciated!